The War Begins: Clyfford Still's Paths to Abstraction at The Clyfford Still Museum from Oct 10th - January 18th, 2015 is an illuminating and exciting exhibit that pulls the curtain back to reveal Still's fervor and struggle to discover a new language in paint. I was fortunate enough to gain a behind the scenes tour with David Anfam, the curator of this show and Dean Sobel, director of the Still museum. The show highlights Still's paintings, drawings, and sketchbooks from 1939-1944, revealing a complex constellation of events that swirled into Still's incredibly focused mind, leading him to discover an abstract, all-over, simplified visual language that would mark the shift of the art world from Paris to New York and a beginning to the lineage of a Western fully abstracted visual language. Here are a few images from my sketchbook yesterday as I was working out some of the final details for Artmap Fort Collins. I'm back at the museum today to finish the painting for the opening tomorrow! As an artist, my joy is found in making art. I don't think there is an artist out there who would be making art if they did not love it. But the other side of the coin is, what happens to your art once it is made? For anyone making art objects, when someone buys your art, it is very validating. It is exciting. And it allows you continue to do what you love, make art. I spent some time talking with Traci, one of my largest local collectors, and we discussed the joys of collecting art. I met Traci and her husband Tom in 2011 on the Fort Collins Studio Tour. Since that time they have purchased a number of my pieces and we have become friends. I wanted to share with others what impact buying art can have on artists and collectors. "Buying art is a luxury, but it is not frivolous"
How did you decide to start collecting art? When Tom and I were first dating, we went to Columbine Gallery in Loveland. I was surprised to find out there were so many Colorado artists who were making a living from their artwork. I thought that was really cool. I decided I wanted to buy local art as much as possible to support Colorado artists. I liked that it went against the stereotype that one could only buy art and make a living as an artist in a big city. "No matter what your income, if you love art, you should have at least one piece of artwork in your home"
John Kinkade, owner of Columbine Gallery was very engaging. He was warm, and open and would tell us stories about the artwork and the artists. This made it personal and it really is what got me hooked. I would then go home and research more about the artist online. This really enriched my knowledge and the love of the artwork. Meeting local artists through the Fort Collins Studio Tour has also been a great way to learn more about the artists and to collect their work. "Art is an investment. You can change or trade an artwork, but I buy things because I love them and they speak to me. I expect to be with them for a long time." What does a collector gain from buying art? By making an investment in art, you gain the enjoyment of seeing it everyday in your home. There are always new ways in which I see a work. I notice something different due to the light, the time of day, or just seeing it in a new way. My home is my sanctuary and artwork brings me joy." What gets in the way of people buying art? Commitment: It is a commitment-a long term relationship. Sometimes people are intimidated by that, like they will make the wrong choice or change their mind after their purchase. Don't worry. If you love something, you will enjoy it for many years to come. It is also okay to change or trade in the future. Money: People assume that only the rich can buy art. This is not true. There are all sorts of possibilities to buy inexpensive art. Look for young, emerging artists, or small artworks. Intimidation Factor: Do not be intimidated! Go into galleries, look at art, ask questions, learn what you like. Ask if the artist has smaller works available. Go to studio tours, talk to the artists. Look in cafes, at art fairs, anywhere. Keep your eyes open and trust what you love. No one can tell you what will bring you joy in your home. Do you have any final thoughts you'd like to share about collecting art? Many years ago, before I was seriously collecting art, I saw a painting in a cafe. It was of a chair and it had a very strong sense of serenity. At the time I did not buy it. I still think about that painting 20 years later! That is the power art can have. This process of re-creating this painting was an evolution of my own spirit. The process itself helped put me more in alignment with my best self. This is the beginning of the painting that became "Evolve"
What is art about? Why do paintings matter? These are questions I ask myself daily, so as to be ever clear about the purpose of my craft and the worthiness of my devotion. Today I was reading Joseph Campbell's Goddesses, Mysteries of the Feminine Divine and in his typical clear and illuminated way, he explained exactly what painting and art is all about. In the history of humans, image making is core to our essence. We have made images in a multitude of forms, often representing deities. What is the function of this image making? Of this deity representation? Campbell states "Now, the energies of nature are present in the outer world, but also inside ourselves, because we are particles of nature. So when you meditate on a deity, you are meditating on the powers of your own spirit and psyche, and on the powers that are also out there." (Joseph Campbell, Goddesses, Mystery of the Feminine Divine, p. 14) This meditation is meant to put one in accord with nature. The function of the image is to align our spiritual nature with the world in which we live. It is not necessary that the image be realistic or abstract, its function is to remind the viewer of his or her spiritual nature. When one assumes that the image of the deity is the concrete meaning, however, its meaning is lost. I see this gap in understanding frequently when viewers do not perceive the value of an abstract image. There is nothing concrete and so it must have no meaning. I often wonder if this missing link in understanding is reflective of our disconnect to the natural world as well as absence of a larger functioning cultural mythology. We are left to read artwork at face value, not perceiving its symbolic potentials. This knowledge of how to be in accord with our own life seems like a foriegn language at times. However, just because the language is not always understood, does not mean that the spiritual meaning is absent. Images have the power to point the way to powers held within each of us to grow and expand our consciousness and to become in accord with the world in which we live. In religious terms, Christ on the cross is not a historical representation of a temporal time and place event, but a symbol that points us in the direction of understanding our own transendence. We are reminded of our potential to die to the energies that have held us back, old habits thoughts and ways of being. And are resurrected into a new larger life, a spiritual life that is more in accord with the world and is not just about our small ego getting what it wants. In the same way, abstract painting points to an interior state of being and recognizes different possibilities within us. By being with a painting one has the potential to remember ones own divinity and expansion. The painting reminds us of our higher nature and points us to this direction. A series of images that records the transformation of the painting Heart-Mind 2012. Oil collage and chalk on canvas, 60 x 48 in. into the painting Evolve 2013. Oil and collage on canvas, 60 x 48 in. prepping the painting "Uncovering" to take to The Lone Tree Art Center-November 16th, 2013-January 5th, 2014. At this time last year I had my studio at The Fort Collins Museum of Art, I was working full-time at The Cupboard, teaching a class at The Murphy Center, and squeezing in time to paint. I was also in the very beginning stages of making some pretty big changes. Today in the studio, feeling both very inspired and peaceful, I realized just how many changes I have made. I also realized these changes are reflected in the painting Uncovering, which will be at The Lone Tree Art Center from November 16th, 2013 through January 5th, 2014. I haven't looked at the painting since June, and was amazed by its energy and luminosity. I thought it the perfect time to reflect back on some events and thoughts that inspired both the painting and life changes. 1.22.13: I have moved out of my studio and temporarily into our apartment. I am excited about the changes to come as well as a few months of concentrated study without rent and First Fridays. 1.25.13: Attend opening of Red/Yellow/Blue at The Clyfford Still Museum. Inspired by this Still quote "I can think of no other way for a serious artist to achieve his ends than by doing what I did-to show that this instrument, the limited means of paint on canvas, had a more important role than to glorify popes and kings or decorate the walls of rich men." 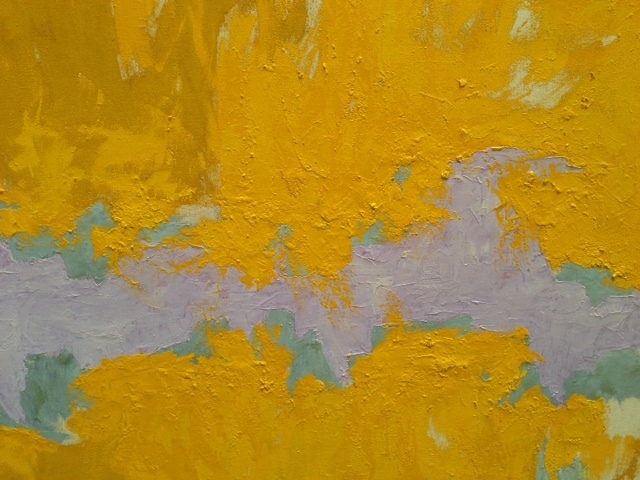 Also, blown away by Still's PH 893-a stunning, breath taking, all-encompassing yellow. I directed my attention to color, fascinated by its ability to have its own presence and power. I began painting small color studies and reading Color A Natural History of the Palette by Victoria Finlay and Color, A Workshop for Artists and Designers by David Hornung. In late May I re-visited the Red/Yellow/Blue exhibit and started working on a 48 x 48 inch panel in yellow. 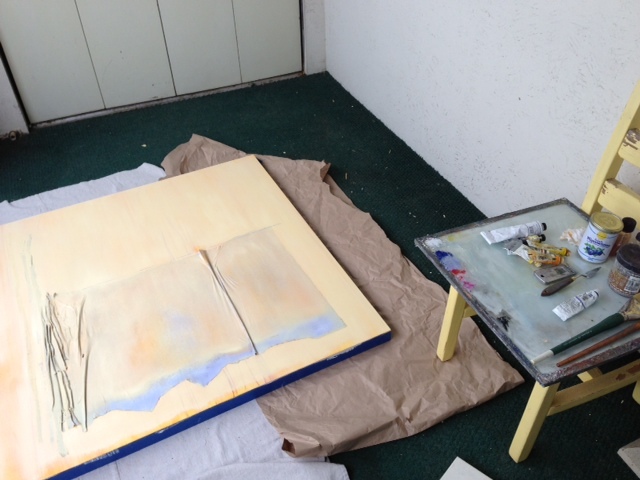 6.5.13 Moved the yellow painting from our tiny living room to the patio to work through its final iterations. Felt a sense of space and expansion. 6.10.13 I gave The Cupboard notice that I my last day would be August 15th. 6.11.13 Ran into friends that had a friend looking to rent out a studio space in her backyard. 6.15.13 Visited the studio space. Incredible. 6.16.13 Said yes to renting the space starting in July. 8.19.13 Arrived for my first full day in the studio. 11.11.13 Worked on yellow, orange, and red squares and a field of large yellow-excited about this because it is becoming more luminous and muted at the same time. Then wrapped up the painting "Uncovering" for the Lone Tree Art Exhibit. Excited. It is a beautiful painting. I feel very lucky to spend my days painting. I am inspired and excited to grow as a painter and am amazed at how much has transpired in less than a year! I am sitting here listening to Sigur Ros's album, Hvar-Heim Samskeyti, and it breeds a certain sort of contemplative mood. I have transformed quite a bit over the last two years...or so it feels. I suppose those that know me best are the ones to provide the true answer to that question. Things I felt were true in my heart have become a little more expansive and a lot less demanding or compelling. I feel a sense of peace and awareness. I am astounded by the people that come into my life and bring such depth and richness to my world. I have been out of my studio for the last three weeks or so, awaiting repairs. I am anxiously awaiting a return to painting tomorrow morning. The space is clearer. The clutter is gone, for now, and my mind feels sharp. I am anticipating that feeling of diving in, getting into the flow, and creating, creating, creating. Tonight, there is fluidity in this evening space, music filling the apartment, the swamp cooler churning, and my thoughts settling on the morning. The gap before the next expansion occurs.